Protein studies, while important to Pauling, comprised only a fraction of his work during the late 1940s and early 1950s. He was overseeing a large, bustling laboratory where visiting fellows, postdocs, assistants, and graduate students were studying a variety of questions, from chemical bonds to antibodies, the structure of inorganic molecules to the nature of metals. Pauling was also penning influential textbooks (General Chemistry in 1949 and College Chemistry in 1950); serving a year as President of the American Chemical Society; speaking widely on chemical topics; and spending an increasing amount of time giving speeches on peace and nuclear proliferation (as well as dealing with the personal and professional fallout from speaking out, often against US government policy). Amid all the activity, however, during a few months in the spring and summer of 1950 Pauling focused his mind on protein structures. The impetus was publication of the grab-bag of ribbons and spirals by Bragg's group, in a paper that Bragg later regretted publishing. Pauling, not wanting to be beaten to a detailed solution of the keratin structure, threw himself back into the race, reading widely, thinking about his own past attempts, and carefully reviewing Branson's two helixes. These two structures, the alpha and gamma helixes, looked increasingly attractive and compelling as Corey went through the painstaking process of checking and refining them. Pauling and Corey came to believe in the structures. But that was only the beginning. The helixes served as a starting point for thinking about other structures besides keratin. Pauling and Corey played with stretching the helixes, flattening them into a sort of pleated sheet, a structure that very much resembled silk. They started modeling more complex proteins like collagen and feather rachis. There was still one major drawback, however: Neither of the helixes matched the 5.1 angstrom repeat that showed up in all of Astbury's x-ray patterns from keratin. The alpha helix, which came closest, made a turn every 5.4 angstroms. No matter how much he tried to reshape his helixes, Pauling could find no chemically reasonable way to make his models match the x-ray data. That is where most chemists would have stopped. In a battle between experimental results and theory, experiment wins, every time. Theory has to match experimental results (or a reasonable, testable reason must be put forward to explain the discrepancy) – that's the way the game is played. By these rules, Pauling's theoretical helixes should have remained unpublished. Instead, feeling "forced into it by the Bragg, Kendrew, and Perutz paper," Pauling decided to ignore the contradictory evidence from the x-ray studies of keratin, and to publish anyway. On October 16, 1950, Pauling and Corey sent a short note to the Journal of the American Chemical Society saying that they had come up with two spiral models, mentioning their hydrogen bonding scheme, and asserting that there was evidence that the proposed structures were present in a variety of proteins. They hinted at a molecular model for silk. They said nothing about the discrepancy between their models and the x-ray data. They ended with the promise that "a detailed account of this work will be published soon." Pauling and Corey were sure enough of their ideas to take a chance and establish scientific priority, in essence saying, "We're first with this idea." Then they went back to work trying to shore it up. See Also: Memorandum from Robert Corey to Linus Pauling. May 25, 1950. See Also: Letter from Linus Pauling to Sidney Weinbaum. November 13, 1950. See Also: Representation of the collagen-gelatin molecule. April - May 1951. 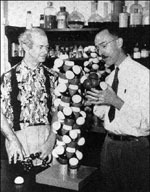 Linus Pauling and Robert Corey examining models of protein structure molecules. approx. 1951. Representation of the pleated sheet configuration of polypeptide chains. April - May 1951.